Their accents and limited grasp of Green Line geography suggested tourists in need of advice. They seemed to appreciate my tips on making their way from Government Center to Faneuil Hall and Quincy Market, and we were chatting like old friends as the driver announced the approach of Kenmore station. By the time the train screeched into Boylston, I’d invited Tara and her granddaughter, Hannah, to an early supper in Brookline. Since the election, our across the hall crew has been talking about getting more intentional about rounding people up for Sunday night dinners. We’re hoping for evenings filled with what our late friend, Charley, used to refer to as “good, honest talk,” but the crush of travel and everyday life keeps getting in the way. Now we had at least a couple of guests lined up, and it took Marton only a couple of texts to recruit a few fellow coaches from his job as director of tennis at Sportsmen’s Tennis and Enrichment Center in Dorchester. Our British guests provided us with verbal snapshots of life in their village of 4,000 just north of London on the Central Line. Tara and Hannah are world travelers, and there were plenty of tales to share around a table that included a Sri Lankan, a couple of expats just back from Europe and a native Bostonian with roots in the Caribbean. Not to mention our resident Hungarian. I had a feeling that I might be wading into deep water when I changed the subject from train travel in India. I asked Tara and Hannah if they were surprised by the UK’s June vote to leave the European Union. Tara and Hannah exhibited such enthusiasm for Britain’s new path that they may not have noticed the slack-jawed reaction around the table. There was no reason to expect their position on Brexit to be otherwise, of course, apart from our assumption that such convivial and well-travelled dinner companions would, well, think like we do. Discretion appeared to be the better part of the valor required to brave the deeper Brexit divides of immigration and race. So we moved on to safer topics. The encounter reminded me of discovering the first known Trump supporter in our extended family. The tip-off arrived courtesy of Facebook, in this instance more a medium of revelation than interaction. Political debate is not expected to be an especially welcome guest at many holiday gatherings today. A Nov. 17-20 poll of 1,003 Americans found 60 percent figuring it would happen but only four in ten looking forward to it. The political diversity at the table we’ll set in Michigan this afternoon may look modest, stretching from Hillary to a few safe-state votes for Jill Stein. In fact, though, the chatter around the kitchen island this morning reflected the sort of substantial differences best accommodated with affection and restraint. So far today, talking across our differences is providing a gentle warm-up for more difficult conversations still to come. 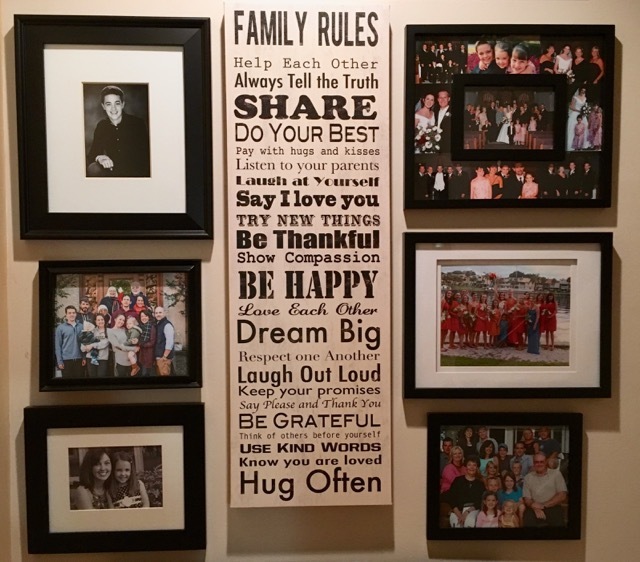 In both, we’ll try to keep in mind the “Family Rules” posted on the wall here at Chez Walsh, especially these: Laugh at yourself, be grateful, hug often. This entry was posted in Conversation, Diversity. Bookmark the permalink.